Dish gardens make wonderful decorative accents for the home or office. They are miniature gardens composed of a variety of plants with similar soil, lighting and water needs and arranged in a way to create a variety of landscapes and nature scenes. The plants are placed within shallow and open containers that allow light to penetrate into the planter. Glass, ceramic dishes and shallow bowls work well for container gardens. You don't have to settle for the traditional container; be creative and use materials that you have in your home. The decorative possibilities are enhanced when you use cans, buckets, wooden boxes or empty milk jugs. You can create a mini landscape by adding rocks or pieces of wood among the plants. Make sure there is enough room to allow for layering of rocks, soil and sphagnum moss (optional) to promote water absorption and limit the amount of soil needed. These arrangements must have a planter shaped to retain humidity within the container. When you collect plants that grow well together, and have the same cultural needs, with contrast in form, height, and texture arranged together in a small container like a shallow bowl, you create an attractive, scaled-down garden. You can find small plants at you garden center. Plants appropriate for an indoor this project include African violets, pothos ivy, dieffenbachia, spathiphyllum, schefflera, English ivy, and begonia. Small cacti and succulent plants such as hen and chickens and aloe vera grow easily from cuttings. They contain water in their leaves and are Well-adapted to desert conditions. 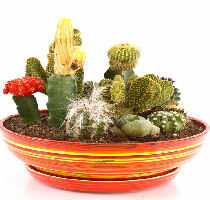 You will need to use cactus mix Potting Soil for these kinds of plants. Cuttings should be allowed to dry in the sun for a few days to seal the cut ends and form a scab before planting. Place the dish garden in a sunny location and water when the top 2 inches of soil feels dry to the touch. 1. Gather plants, container, potting mixture and other materials. Plants that have been watered the day before allows easy removal from their pots. 2. Add 1-inch (2-5) layer of pebbles. You can use sand or granulated charcoal if you do not have gravel. Next, add 2 inches of potting mixture. 3. Remove plants from pots and arrange in dish; for example, the largest plant should be in or near the center if it is going to be seen from all sides. The tallest plant should be in the back if it will be seen from one or more sides. Then add more potting mix. 4. Create the "terrain" by slopping potting mixture to make hills and add decorative items like small figurines, pastel-colored pebbles, sea shells, driftwood, or things you like. 5. Water by spraying or you can use a turkey baster to avoid getting the foliage of centain plants (like african violets) wet. 6. When completed, be sure to place in adequate light depending on your selected plants. Dish gardens not only make great decorative accents, but they can also be great living gifts that can truly make someone feel special.